If you are looking for a detox clinic in Brooksville or Spring Hill , then you have come to the right place. Dr. Eyad Alsabbagh, as a Pain Management Physician, is experienced in the field of pain management and addiction. Our detox clinic in Brooksville is equipped with the necessary facilities and staff to treat people who are suffering from addiction. What is a detox clinic? The staff and the clinic work together with the patient to try to free them of their addiction. Detox Clinic Spring Hill & Brooksville – Why is it better than home detox? The truth is that detoxing from home may be risky; depending on the type or amount of the substance you’ve been taking and how long you’ve been using, it may even be deadly. Detoxing from opioids or alcohol can be a particularly dangerous process which requires medical supervision to ensure a safe withdrawal. Better not experiment at home. At our detox clinic in Spring Hill, you can consult with our medical professionals about your addiction treatment. Our specialists have years of withdrawal management experience and can provide a thorough assessment of your status and risks. We will also help to determine an appropriate course of care. Going to a detox program gives you spiritual, mental and physical support for removing toxins from your system; cleansing your body and mind of drugs gives you a fresh start for a new life. Detox Spring Hill – the perfect place to detox and overcome your addiction! At our Detox Clinic in Spring Hill and Brooksville, you will find the best medical specialists in the area. 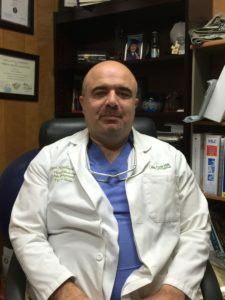 Dr. Eyad Alsabbagh, an Interventional Pain Management Physician, is experienced in the field of pain management and addiction. Anyone who wants to eliminate their dependence on drugs or alcohol should undergo detox at our licensed detox facility, where the process is monitored and supervised by our medical professionals. 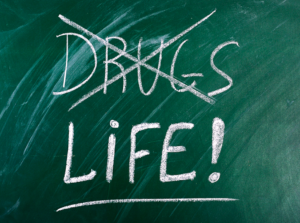 You don’t have to suffer from addiction or its negative consequences on your life any longer. Make an appointment at our clinic and let us help you get back to normal life. 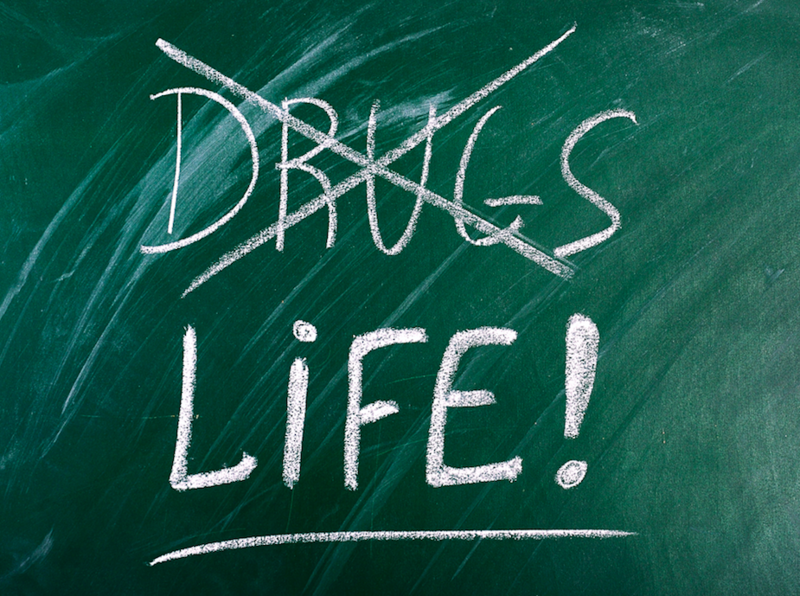 We’re looking forward to helping you live your life free of alcohol and narcotics! What happens at a Detox Clinic? How does a detox clinic in Brooksville and Spring Hill cure people of their addiction? Depending on the severity of the addiction, benzodiazepines may be used to help reduce the withdrawal symptoms. ‘Delirium tremens’ is a severe form of withdrawal which is associated with symptoms such as seizures, anxiety, mental confusion, and hallucinations. If used, medications such as benzodiazepines, are part of a larger, holistic treatment plan which addresses both the mind and the body. The FDA has approved several medications which can be used to aid the treatment of drug addiction. This includes suboxone. Using medications such as suboxone is just one part of drug addiction treatment. Medications are part of a bigger, holistic treatment plan, addressing both the mind and the body. 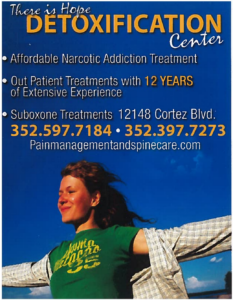 Suboxone is a mix of buprenorphine and naloxone. It is used in the treatment of opioid addiction. In cases of severe addiction, the use of suboxone can greatly help relieve the addiction of opioids while lessening the withdrawal symptoms. When taken as prescribed, suboxone can be a very effective method of treating addiction. What should you expect from our detox programs in Spring Hill and Brooksville? The positive benefits of a detox program are multiple and often crucial and life-changing. Nevertheless, the treatment process is not without its challenges: both physical and mental changes that occur during a detox may not be pleasant. But the environment in which patients undergo the changes is comforting, as patients are surrounded others who are going through a similar process and they can support each other; therefore, the result is worth the trial. However, professional staff at our detox program in Spring Hill want to build a clear picture of what will happen, as we believe that facts enable you to get prepared better for the process and, most importantly, get rid of any misconceptions. Evaluation and assessment of each individual are crucial to designing an effective detox plan. Patients undergo a physical examination at this stage, in order to correlate stated usage with the actual alcohol levels or chemicals in the body. Many patients with addiction also experience mental disorders, which need to be identified at this stage. Finding out more about a person’s background and the circumstances surrounding their issues with drugs or alcohol may help a great deal during the detox program. Detox is a process that many people wrongly believe they are capable of undertaking themselves. We do not try to prove this is wrong, but we want our patients to understand the withdrawal process may have severe symptoms and 24-hour medical care will ease it. The duration of detox depends on the substance one is addicted to and for how long it has been abused. Once detoxification has been completed and the body has been completely cleared of substances, treatment becomes less challenging for the majority of people. Counseling is crucial in helping understand the circumstances and causes of an addiction. Many people seek a solution in alcohol or drugs after traumatic life events, while others consider it a coping mechanism for anxiety. The goal of counseling is to restore the balance of a patients’ mind, body, and spirit, and to teach them to handle life events in a state of sobriety. One of the goals of our detox programs in Brooksville and Spring Hill is to prepare patients for a potential rehab program and to avoid relapses. This is achieved by teaching patients to identify and manage situations that trigger drug/alcohol consumption. As stressful situations are unavoidable in life, what matters is a patient’s reaction. Our detox program is not a short-term solution for addiction issue; it is a lasting support program that can provide patients with the motivation to commit. Additionally, having a local network of people in a similar situation is a powerful force towards recovery.